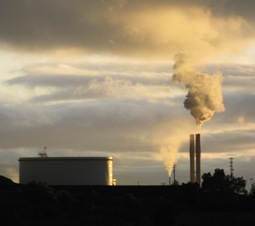 In response to a court ruling (which it’s still appealing), the California Air Resources Board today issued a new analysis of its proposed carbon trading program, weighed against several alternative means of reducing greenhouse gas emissions. The fresh look includes the original five options, including cap & trade and the option of doing nothing at all. It does not add any new options but rather seeks to flesh out the other three. The non-trading options include regulating emissions at the source, implementing a straight-up tax on carbon emissions, and a mixed bag of actions. The reworked analysis expands discussion of those three alternatives from a few pages to more than 60. It will be up to the courts to decide whether the extra paper carries enough substance with it to comply with the California Environmental Quality Act. Regulators were sent back to the drawing board by a Superior Court ruling in May that favored plaintiffs in a lawsuit filed by environmental justice advocates. The groups charged that the state sidestepped its own environmental laws in its original implementation plan for AB 32, stacking the deck toward a cap & trade program, and giving short shrift to other approaches. The judge agreed. The Air Board appealed but went back to work on alternatives, anyway. The release of today’s “functional equivalent” document starts the clock on a 45-day period for public comment. The Air Board is scheduled to consider those comments at its meeting on August 24. As long as you are looking at the air — how about looking at the geoengineering weather modification spray from planes — aerosol chem trails — horrible pollution and noone is addressing that issue. No more blue sky and goodbye to solar programs — white haze from all the polllutants. True environmentalist will realize the earth bats last. The sooner we do ourselves, the human race, in, the sooner the earth can thrive again. REAL environmentalist would embrace anything the brings a speedy end to man. Pollution? Bring it on! Nuclear meltdown? Let’s have it! In a million years, Mother Earth will hardly remember the parasites that briefly inhabited her crust. If I can convince all you whining tree huggers that this is REALLY the best thing for the planet, I will be able to provide for my family in the meantime. Cap & Trade is a very bad policy. I have submitted testimony over 3 years ago to CARB questioning it. The basic assumption and those pushing it reflects the CA “de-regulation” program that was a miserable failure: market forces will balance out the supply and demand for credits (certificates etc). That form of economics failed in 2000 and will still do so today. Cap & trade has failed (NOTE: Chicago Climate Exchange) and is very questionable in the EU. Where I am now and was last month meeting and talking about this issue and others. RECOMMENDATION: use a tax incentive instead on carbon.